Figure 1. Orion heads for orbit atop an Ares I rocket. Figure 2. Orion crew and service modules. Figure 4. An Aries V heavy-lift rocket blasts off, carrying a lunar lander and a "departure stage" needed to leave Earth's orbit (left). The crew launches separately (center), then docks their capsule with the lander and departure stage and heads for the moon (right). Image and caption: NASA. Figure 5. Three days later, the crew goes into lunar orbit (left). The four astronauts climb into the lander, leaving the capsule to wait for them in orbit. After landing and exploring the surface for seven days, the crew blasts off in a portion of the lander (center), docks with the capsule and travels back to Earth. After a de-orbit burn, the service module is jettisoned, exposing the heat shield for the first time in the mission. The parachutes deploy, the heat shield is dropped and the capsule sets down on dry land (right). Image and caption: NASA. Figure 6. (1) A heavy-lift rocket blasts off from Earth carrying a lunar lander and a "departure stage" (2) Several days later, astronauts launch on a separate rocket system with their Crew Exploration Vehicle (CEV) (3) The CEV docks with the lander and departure stage in Earth orbit and then heads to the Moon (4) Having done its job of boosting the CEV and lunar lander on their way, the departure stage is jettisoned (5) At the Moon, the astronauts leave their CEV and enter the lander for the trip to the lunar surface (6) After exploring the lunar landscape for seven days, the crew blasts off in a portion of the lander (7) In Moon orbit, they re-join the waiting robot-minded CEV and begin the journey back to Earth (8) On the way, the service component of the CEV is jettisoned. This leaves just the crew capsule to enter the atmosphere (9) A heat shield protects the capsule; parachutes bring it down on dry land, probably in California. Image: NASA/BBC. Artist's concept by John Frassanito and Associates. Orion is a crewed spacecraft originally intended to be the Crew Exploration Vehicle component of the Constellation Program, which was cancelled in 2010. Orion subsequently became the basis of the Multi-Purpose Crew Vehicle (MPCV). What follows describes the role that Orion would have played in the Constellation Program. For a description of its new planned role, see the separate article on the MPCV. In Constellation, Orion would have have replaced the Space Shuttle Orbiter as NASA's primary manned space vehicle, delivering crew and cargo to the International Space Station. It was also intended that it would eventually return astronauts to the Moon. On August 31, 2006, NASA awarded a five-year $3.9-billion dollar contract to design and build Orion to Lockheed Martin, which beat a joint bid from Northrop Grumman and Boeing. Orion had been scheduled to make its maiden orbital flight no later than 2014 and its first lunar flight no later than 2020. 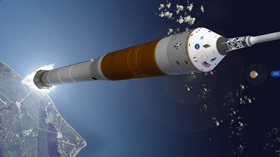 The booster that would have launched Orion was called Ares I; a larger cargo launch vehicle was known as Ares V.
The Orion crew module (CM) is a conical shape with a 70° slope like that of the Apollo Command Module. This shape was deemed by NASA to be the safest and most reliable for re-entering Earth's atmosphere, especially at the velocities attained following a direct return from the Moon. The Orion CM is 2.5 times the volume of the Apollo CM. It is 5 meters (16.5 feet) in diameter and has a mass of about 21 tons. Four to six astronauts will travel aboard it, compared with the three-person capacity of the Apollo capsule. A combination of parachutes and airbags will be used for the final descent to Earth, enabling the Orion CM to come down on land and eliminating the need for costly naval recovery at sea (although spashdown will be retained as a backup option). 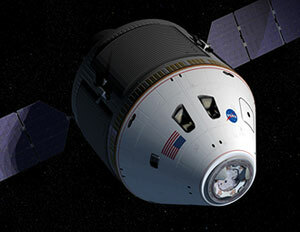 NASA expects to be able to reuse each Orion CM up to 10 times. Only the heat shield, made of the same resin epoxy employed on all pre-Shuttle spacecraft, is non-reusable. It will be ejected following deployment of the parachute-airbag recovery system and a new one fitted for the next mission. The Orion service module (SM) is cylindrical and equipped with a pair of solar panels which can be deployed like those of a Soyuz capsule. Its main propulsion system consists of a Delta II upper stage engine using nitrogen tetroxide and monomethyl hydrazine hypergolic propellants. These same propellants will supply the spacecraft's maneuvering thrusters, known as the SM Reaction Control System (SM RCS). NASA anticipates that, on a lunar mission, the SM RCS would be able to act as a backup for a trans-earth injection burn in case the main SM engine fails. The SM's twin liquid oxygen tanks and a single tank of liquid nitrogen will provide the crew with air for breathing during most of the mission, while a surge tank in the Orion CM will supply about 3 hours of air after the SM has been jettisoned. Lithium hydroxide cartridges will "scrub" the carbon dioxide exhaled by the astronauts from the ship's air. Fresh oxygen will be added and the air then cycled back into the system loop. To allow the Orion spacecraft to dock with the International Space Station, it would have been fitted with a simplified version of the Russian-developed universal docking ring used on the Shuttle fleet. Both the spacecraft and docking adapter would have been covered over with a Launch Escape System (LES) identical in design to that found on the Soyuz spacecraft, along with a fiberglass "Boost Protective Cover" similar to that used on the Apollo CM. Like its predecessor, it would have protected the Orion CM from both aerodynamic stresses and potential catastrophic damage during ascent. Coupled with a lunar lander, called the Lunar Surface Access Module (LSAM), the Orion spacecraft would have been able to carry twice as many astronauts to the lunar surface as Apollo did and for longer stays – initially four to seven days. While Apollo was limited to landings along the Moon's equator, the new ship would have carried enough propellant to land anywhere on the lunar surface. 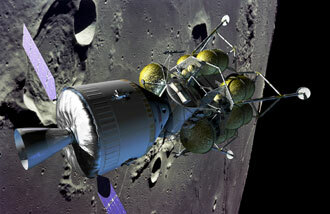 Once a lunar outpost had been established, crews would have remained on the lunar surface for up to six months. Orion could also have operated without a crew in lunar orbit, eliminating the need for one astronaut to stay behind while others explored the surface. NASA would have begun the first lunar expedition by launching a LSAM and a propulsion stage, called an Earth Departure Stage (EDS), atop an Aries V heavy-lift rocket. This would have consisted of a lengthened Shuttle External Tank and a pair of Solid Rocket Boosters capable of putting up to 125 tons in orbit – about one and a half times the mass of a Shuttle Orbiter. The cargo it carried would have been able to wait for up to 30 days in orbit for the astronauts to launch aboard their Orion spacecraft. Carrying a crew of four, Orion Crew and Service Modules would have blasted off atop an Aries I single solid-rocket booster consisting of four segments, like those flown with the Shuttle. Once in orbit, the manned orbiter would have docked with the LSAM and the EDS in preparation for the trip to the Moon. After a three-day journey, the four astronauts would have climbed into the LSAM, leaving the Crew and Service Modules in lunar orbit. After landing and exploring the surface for seven days, the crew would have blasted off in a portion of the lander, docked with the CSM and returned to Earth. NASA envisioned the possibility of building a semi-permanent lunar base, where astronauts would have made use of the Moon's natural resources for water and fuel. A number of other spacecraft, both in fact and fiction, have been called Orion. Project Orion was a US scheme, investigated in the 1960s, to use nuclear propulsion for journeys to the Moon, planets, and stars. Orion was also the name of the Lunar Module that landed astronauts on the Moon in 1972 in the second-to-last Apollo mission, Apollo 16. In science fiction, Orion III was the name of the space plane that transported a character in the film 2001: A Space Odyssey to an orbiting space station.